Junior is coming together. After almost 30 years of moving around, disassembled from coast to coast, Junior landed in my home, purchased this winter from a retired weaver. 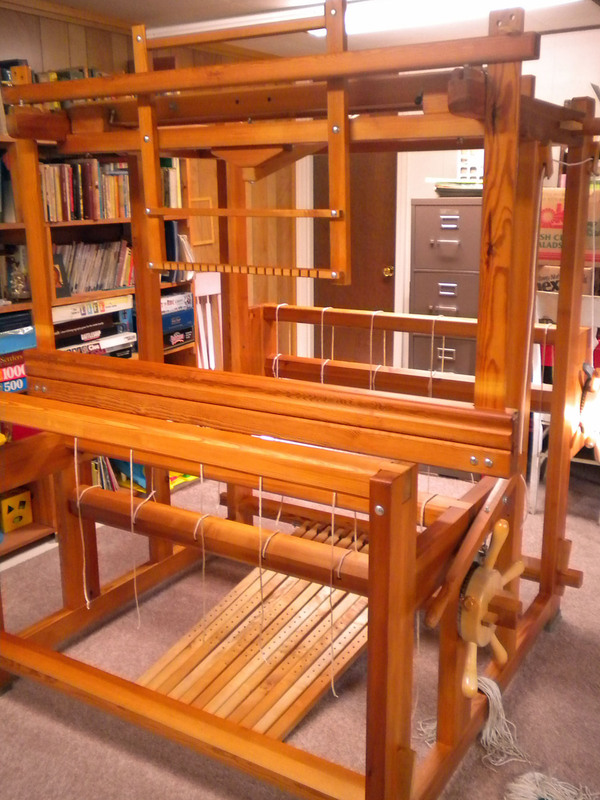 Junior is a 10-shaft Glimakra countermarche loom, 47” wide with a drawloom frame on the top. 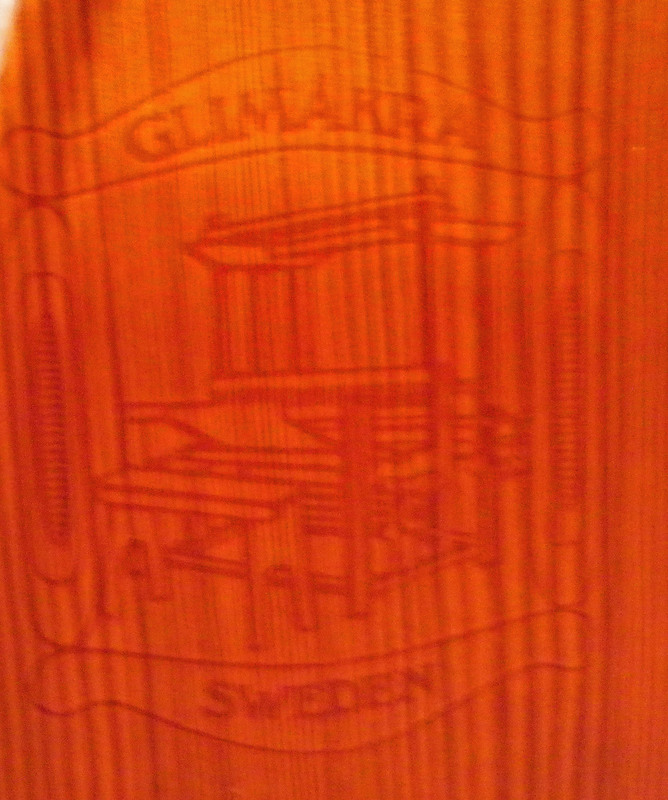 I say “on the top” because that is its proper position, but it lay for many years in so many pieces along with a multitude of wooden sticks and metal bars that comprise the loom. And I have to guess a little on that proper position, because this draw attachment is an earlier version of the one I have been using since 1993 which is a more robust design. The first thing I did when getting it to my basement was to give it a thorough cleaning with wood conditioner. The wood was so very dry and dusty. Cleaning meant taking off yards of tangled Texsolv cords and washing those too. And I did a quick inventory of parts to be sure I could put it together. Ah, two vital missing components: the wheel ratchets to turn the cloth beam and the warp beam, and the wooden wedges that hold the frame together. Ordered those and waited patiently. Yesterday, my kind husband helped assemble the frame and square it up. Then it got a second go-over with wood conditioner. 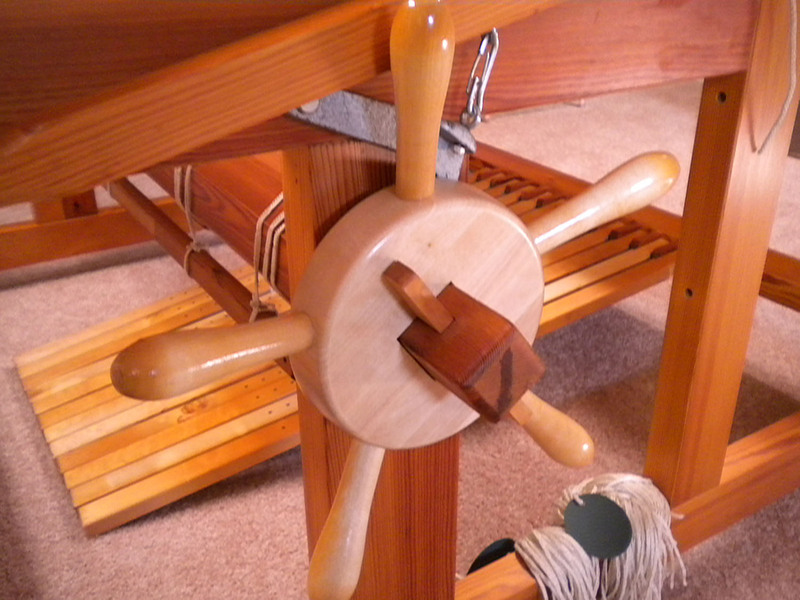 The loom fairly glows now, although the wheel ratchets are a decidedly lighter color than the rest. Now I’m sorting and matching which cords go where. They all were cut to specific lengths for specific purposes; it’s just a matter of finding which ones fit on which component. All along, I’ve been pondering what the first warp will be. 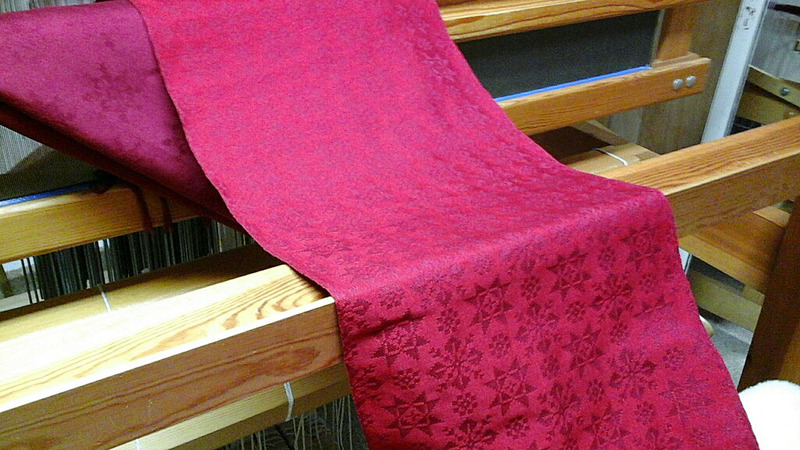 I know there will be a fair amount of adjustment as I get it threaded and balanced, so the first warp should be simple. And since it has the drawloom frame, I might as well set it up for a drawn design. Perhaps just some cotton yardage that I can use for towels or aprons will be the inaugural project.